The Boxing Truth®: What’s next for Dierry Jean? When undefeated Jr. Welterweight contender and current North American Boxing Federation (NABF) Jr. Welterweight champion Dierry Jean entered the ring to square off with late substitute Juan Jesus Rivera this past weekend he entered as the number one contender in the World Boxing Council’s (WBC) Jr. Welterweight ratings. Jean who entered the fight with an impressive record of 23-0, 15 Knockouts, with a career knockout percentage of well over 60% would seem as a likely world title challenger in the not too distant future. Jean did not disappoint the crowd in attendance at the Hilton Lac Leamy in Gatineau, Quebec, Canada. Jean out classed a fighter in Rivera who took the fight on less than a week’s notice when original opponent Cosme Rivera had to pull out of the fight. Jean also faced a fighter in Rivera who weighed in for the fight a full seven pounds over the 140lb. Jr. Welterweight limit. Jean’s quick hands and measured timing were clearly too much for Rivera to overcome. Jean dropped Rivera in the first round with a perfectly timed counter left hook at the end of the round and brought the fight to a conclusion in the closing seconds of the second round, flooring Rivera for the second time with a devastating right hand. Rivera gamely made it to his feet before the bout was stopped by Referee Michael Griffin. One thing that any fighter must show at some point in their career is the ability to adjust. In this fight Dierry Jean showed that not only could he adapt to a change of opponent but he could also dominate a fighter who had a size advantage. Although on the surface this fight did not answer too many questions in regard to just how good Dierry Jean is, one should not take away from what was an impressive performance. The argument of some could be that perhaps Jean has yet to be tested against world class opposition thus far in his career. This observer respectfully disagrees. Prior to his knockout win over Rivera, one could argue that Jean was tested against two seasoned veterans. In his fights with Lanardo Tyner and Ivan Cano, Jean not only stepped up in class of opposition but he was also able to show that he can go deep into fights. He was taken to the twelve round distance for the first time in his career in his bout with Tyner when he won the NABF Jr. Welterweight title and was able to score an eleventh round stoppage of Cano in his last bout prior to meeting Rivera. All boxers eventually have to answer questions in regard to their stamina and how they perform against world class opposition. Thus far Jean has done all you can really ask of a top contender, win and win impressively in order to maintain and generate interest as he awaits his shot at a world title. One might argue however that Jean could be viewed as an odd man out currently in the Jr. Welterweight division. Despite being rated number one by the WBC, Jean actually is number two behind Lucas Matthysse who currently holds interim status in the WBC and of course unified WBC/WBA Jr. Welterweight champion Danny Garcia who is scheduled to defend his world title against multi-division world champion Zab Judah on April 27th. The IBF world champion in the Jr. Welterweight division Lamont Peterson is scheduled to defend his world title this week against former champion Kendall Holt. The WBO world title in the Jr. Welterweight division is arguably up in the air as it remains uncertain as of this writing as to whether or not the current WBO champion Juan Manuel Marquez intends to return to the division following his thrilling knockout victory over Manny Pacquiao in their fourth fight last December. The current world championship picture in the Jr. Welterweight division at least in the short-term future would appear as though Jean would not be in the discussion for a world title shot. So, the question is what is next for Dierry Jean? The most logical option in this observer’s eyes would be to see Jean face Lucas Matthysse who is coming off of a devastating one punch first round knockout over Mike Dallas Jr. in January of this year. Conventional wisdom would be that Matthysse the fighter who currently holds interim status in the WBC would face the next available/highest rated contender in Dierry Jean and the winner of that fight would then face the winner of the Danny Garcia-Zab Judah bout. If however conventional wisdom does not win out, there are a few opponents that could pose for interesting match ups for Dierry Jean in the not too distant future. Amir Khan: Khan is probably the most notable opponent currently that Jean could seek a fight with. Khan has gone 3-2 in his last five fights and is coming off of an impressive performance in stopping previously undefeated Carlos Molina in December of last year. Khan is in the rebuilding process after losing title fights in 2011 and 2012 to Lamont Peterson and Danny Garcia. It is certainly possible that Khan may view a fight with Jean as a way to springboard himself back into the world title picture. Like Jean, Khan has quick hands and will almost definitely be viewed as the toughest test for Jean thus far. One thing that may work to Jean’s advantage if he should meet Khan is Khan has shown in the past that he is willing to mix it up against his opponents but has also shown that he can be vulnerable as was the case in his fights with Bredis Prescott, Marcos Maidana, and Danny Garcia. Both Prescott and Garcia were able to knock Khan out. For a fighter with the speed and power of Jean it certainly would be to his advantage to force Khan into a fire fight early. A fight between the two could be a significant draw in either the UK or Canada where Jean is based. A fight that is a hot ticket seller would be an obvious win/win for both fighters and if the fight takes place this year, it could end up being one of the more interesting fights that can be made. Pier-Oliver Cote: Much like Jean, Cote is an undefeated hot rising Canadian prospect. Much like Jean, Cote has a career knockout percentage of well over 60%. The comparisons between the two don’t end there. One might argue that both have yet to be in against top caliber competition however, a fight between the two may very well produce fireworks. Cote is currently rated number five by the International Boxing Federation (IBF) and could view a fight against fellow undefeated Jean as his opportunity to get a world title shot. Like Jean, Cote fights at a fast pace and has shown speed and power. Cote’s most notable fight to date took place in November 2011 when Cote scored a second round knockout over American contender Jorge Teron. Cote showed in that fight that he can be explosive with his offense however there was a brief moment where Teron was able to wobble Cote with a right hand while being on the defensive. What makes a fight between Jean and Cote interesting in addition to the similarities between the two is the question of how Cote would be able to deal with someone who has speed and power that is similar to himself but also, can Cote deal with a fighter with such precision timing and ability to counter punch as Jean? Cosme Rivera: A fighter who should not be forgotten in the list of potential opponents for Jean is Cosme Rivera. The biggest obstacle that seems to stand in Rivera’s way right now is resolving visa issues that would presumably allow him to travel outside of his native Mexico. He has been scheduled to face Jean twice, however recurring visa problems have stood in the way of the fight taking place. Rivera however is a grizzled veteran of fifty-four professional fights and is a former world title challenger. 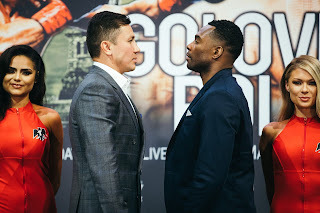 One might argue that in terms of experience Rivera might be the leading candidate, a would be gatekeeper that Jean should have to get passed before he sets his sights on the elite of the Jr. Welterweight division. No matter which route Dierry Jean decides to take for his next fight, one thing is clear. Jean is the latest highly touted prospect to come into the 140lb. Jr. Welterweight division. A division that has seen many great fights between all time greats over the years. Will Dierry Jean be the next elite fighter of the Jr. Welterweight division? Only time will tell.